The latest movie adaptation of Brian Garfield’s notorious 1972 novel has not had an easy journey to the big screen. Over more than a decade, multiple directors have been associated with the project, including Sylvester Stallone, Joe Carnahan as well as Aharon Keshales and Navot Papushado. Actors such as Liam Neeson, Russel Crowe and Frank Grillo have been on the shortlist to play Paul Kersey. Yet due to differing opinions as to how the subject matter of vigilantism should be approached, most of these earlier projects failed. Joe Carnahan apparently wanted to explore the concepts of “toxic masculinity” and gun culture but studio executives simply wanted a more traditional action thriller. This resulted in a particularly acrimonious public falling out in which the boss in question was labelled a “gutless turd” by Carnahan. 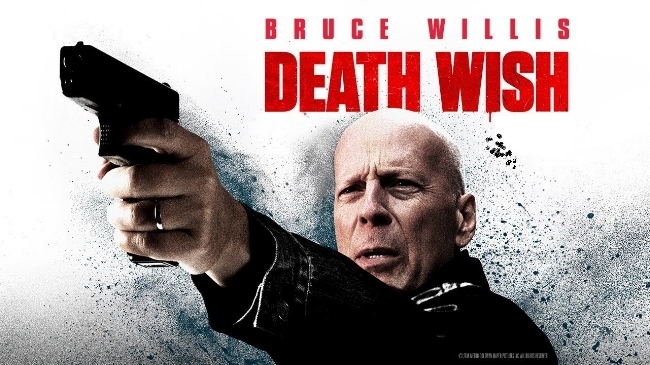 Oddly enough the job of remaking Death Wish finally went to horror film maker Eli Roth. And as you would expect from a director with such credentials as Cabin Fever, Hostel and The Green Inferno, his grisly signature set pieces take pride of place in the proceedings.